Another novel about Vlad Taltos, the assassin-hero of Jhereg and some others. This one was fun and scary to write, because I was working with three different time lines, and I wanted them to all make oblique comments on each other, and to all come together at the end, and I had no idea if they were going to. I was very relieved when it worked out. I’m pretty happy with it. Nobody’s commented on this one? Terrible. Taltos is the first of your books I owned, because all the others were available in the local library system, but this was not. Young Vlad has an anger and accompanying chutzpah that his older self seems to have gotten better at restraining or reining in, but which I very much related to at the time (well, the anger. The chutzpah i mostly just wished for…). Brokedown Palace was the first of your books I read and this was the second, and it’s my favorite. It explains how Vlad developed the relationship with Morrolan, Sethra and Aliera via a great adventure; it’s a great analysis of how people from wildly different backgrounds, and who start out hating each other quickly develop respect for and loyalty to each other. I can’t explain my love for it nearly as eloquently as you wrote it but I have no problem re-reading it every time you come out with a new book. That’s delightful to hear; thank you. I re-read this recently, and it occurred to me that Sethra’s anger at Vlad’s “Standard rates for the job you did” line had to be feigned for the benefit of Morrolan. She’s known Vlad since he was a child, and couldn’t seriously be surprised that he would react badly to her killing of his man. A few minutes later she even says, “We knew you to be a Jhereg as well as an Easterner, and had been expecting you to respond as a Jhereg only,” which is true of Morrolan but not of her. Frankly, if Morrolan were a little brighter he might wonder why someone with 200,000 years of life experience is still capable of being surprised or offended by anything she hears. Possible, but I had a very different read on that. Being old and wise in no way makes one infallible (see Verra, for example). We know that Sethra took an interest in Vlad from early in his life. This may be because he was a reincarnation of Dolivar, because she has access to a prophecy linking Vlad to a Great Weapon, both, or some other, unknown reasons. Regardless of the purpose, Sethra kept in close contact with Vlad (in her identity as Kiera) since he was 11 years old. Despite this close study, when she first decides to approach Vlad in her Sethra identity, she misjudges his reactions to the point of near-catastrophe. Vlad and Morrolan almost kill each other, and Vlad then almost manages to provoke Sethra herself into a killing rage. At this point, it is made starkly clear to Sethra that she has much less insight into Vlad’s character than she thought she had. I believe she decided to rectify this situation. After some thought (and work with the Necromancer), she comes up with a way to get Vlad to talk about his innermost thoughts in a way that she will have access to. In this scenario, it is Sethra who contacts SB, and gives him the gold to give to Vlad. This scenario is further supported by Vlad’s self-description of his narratives as “I’m just telling you what happened, and what I was thinking, because that’s what I’m being paid for (H 258). All book discussions here have spoilers. A little New Year cheer, I hope: I have a friend with Asperger’s. When we met almost 10 years ago, he was mid-20s with the social skills of a 13 year old and he was working on being more adultish, as he put it. A while back he asked me for a grown up book to read, “Something like Star Wars meets Harry Potter in the real world”. I ended up offering him Jhereg since a book with an assassin hero in a realistic setting with magic was as close to that as I could come. That was 3 or 4 years ago. 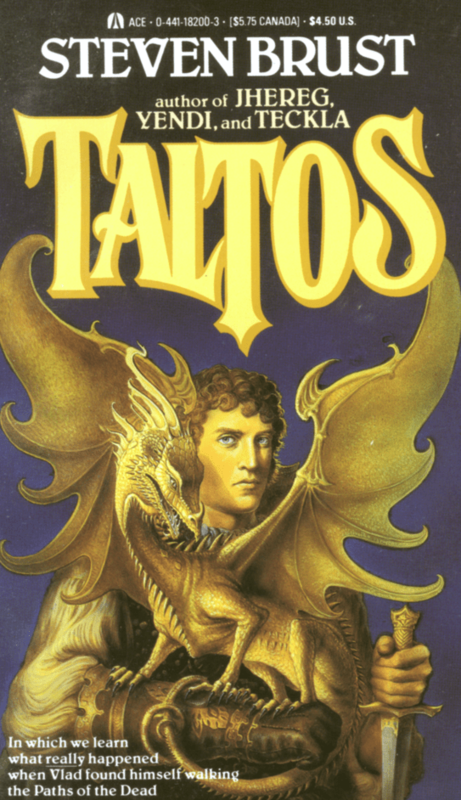 Anyhow, before leaving to visit family a few weeks ago, he actually asked about other books in the series because the story had stuck with him that long, and I ended up lending him Taltos. The fact he remembered the storyline and wanted another book in the series – which he just wrote to let me know he’s loving – is really remarkable, so I wanted to let you know yours are the first grown up books my friend is enjoying. The down side is we had a long discussion on the timeline issue – he really needs things to be in the “right” order, and when he found out Yendi was the second book in the series but was set before Jhereg I had to go over all the plots to assure him Taltos is the beginning of the story. God only knows what I’ll do if he gets to Tiassa – pretend it doesn’t exist, probably. That’s great to hear; thank you.